As of yesterday, I was only mildly miffed at the Academy for failing to shortlist the highly praised Italian film, Gomorrah, for its Best Foreign Language Film Award. It's a good film, but I never believed it was worthy of the award. 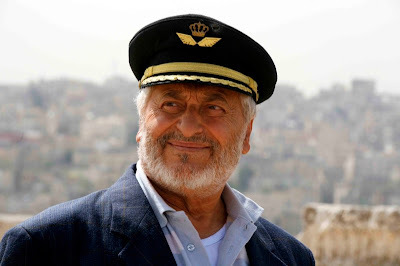 But that was before I saw the Jordanian entry, Captain Abu Raed. The folks at NeoClassics Films were kind enough to supply me with a screener of the film, and after watching it last night, I fell in love with it. It is a completely charming, deeply moving fable about an elderly airport janitor who is mistaken for an airplane captain by the neighborhood children after wearing home a pilot's hat he found in the trash. You would think that this would be the kind of thing the Academy would devour. Sure it could have used a bit more directorial polish, and it has a sentimental streak a mile long, but it packs a huge emotional wallop. I'll admit, I cry a lot at movies. It doesn't take much. But when this thing was over I just sat there and sobbed for entire end credits. I'll write a full review soon. I just wanted to add my voice to the outrage. It's not as bad as snubbing 4 Months, 3 Weeks, and 2 Days, Silent Light, and Persepolis last year. But once again, the Academy should be ashamed of themselves.